ECCO Oxford sell ECCO brand shoes and accessories from their store in Oxford and from their eCommerce site ecco-shoes.co.uk. Shoes are a very competitive product, how can ECCO Oxford ads be seen by the right people? The cost per sale was currently too high, how could we use Google Adwords to help ECCO Oxford get more orders at a lower cost? Let’s go through the steps we took to achieve these results. ECCO Oxford are an ECCO shoes franchise. That means that there are many other businesses in the UK selling the same products at the same price, so any marketing they do is competitive. It was critical to find new marketing methods to bring in a strong ROI. 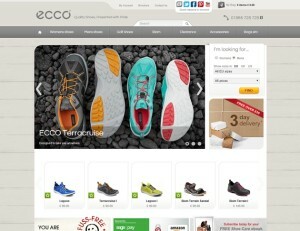 Google Shopping Campaigns, being a new area, was of interest to ECCO Oxford. Could it deliver new customers? Could it work at least as well as their keyword-targeted PPC ads? We saw the real potential in launching Google Shopping Campaigns for ECCO Oxford, so we recommended that they invest some of their marketing budget into Product Listing Ads to take advantage of this powerful new route into the search results. How do we build and create Google Shopping Campaigns? The first stage in implementing Google Shopping Campaigns for any client is to their product feed right, so we started by analysing the products and product information on ECCO Oxford’s website. Using this data, we built a targeting strategy – how we wanted to cut and dice the product range to optimise the campaign (including lots of things we might want to test in the future). We ran through that targeting strategy with the ECCO Oxford to make sure we weren’t missing any tricks, and then turned the targeting strategy into a feed brief. A brief is vital to creating a future-proofed feed that can give us the information we need to run any future test or optimisation activity. Creating a feed takes a lot of time, so it’s important for us to make sure we’re not going to be going back to a client every month requesting feed changes! We then liaised with ECCO’s web developer to get the feed built. This included briefing them, prompting them, testing the feed, doing everything necessary to get that feed created and functioning into ECCO’s Adwords Account. Once the feed was in place, we started building out the Google Shopping Campaign Targeting, implementing the different targeting methods to find the ones that bring the best traffic at the lowest price. With the account fully set up within the first month, the next aim was to focus on continually optimising the ongoing activity. Ongoing optimisation of the Google Shopping Campaigns is essential to keep the account running at a profitable level. This includes adapting the activity to fit with a changing product range and adapting with to reflect the changing fashions and seasons. There’s also work to be done in refining the targeting, using the promotions add on as well as managing bids and budgets to achieve the optimum level of traffic for the spend budget available. Doing all this allows us to keep on pushing for better and better results! Want to find out how we could help your business achieved results like these? Call us today on 01865 980 630 or email us at Info@DIgitalGearbox.co.uk.